The Telstar 1 satellite inspired a chart-topping pop tune, the iconic black-and-white hexagonal Adidas soccer ball, and maybe even a Doctor Who creature, the Mecanoids. Most of us will never have the opportunity to travel into space. But we can feel connected to it in other ways. Above us right now, and every day, are extraordinary old satellites from the 1950s and 1960s, orbiting at speeds of 7-8 kilometres per second. They’re part of our space heritage. Deciding which parts of this heritage should stay, and which should be on a “hit list” for removal, is the tricky bit. Cultural heritage is defined as “things from the past and present, worth preserving for present and future generations”. In recent decades there has been a movement to recognise the heritage of the modern world, including the Cold War, aviation, mass manufacturing, computing, and space exploration. This includes space junk in Earth orbit. 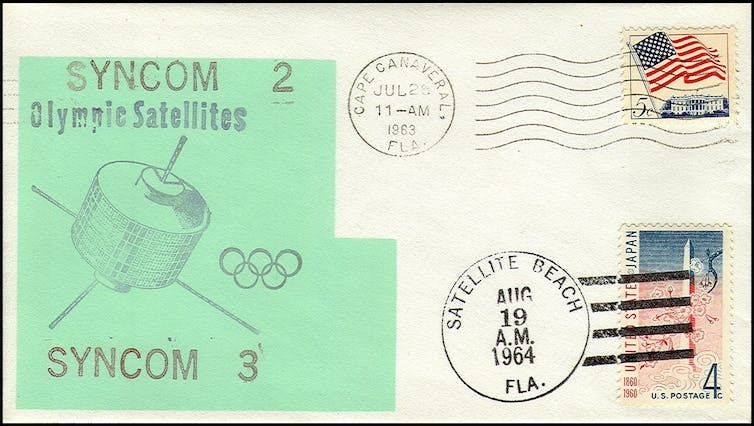 This first day cover shows the Syncom 2 and 3 satellites, used to televise the 1964 Tokyo Olympic Games. They also provided telecommunications in the Vietnam War. Space junk is the archaeological record of the Space Age, in which everyday life on Earth has come to depend on satellite services such as telecommunications. NigComSat 1, Nigeria’s first telecommunications satellite. The Vanguard Adrift Twitter account is part of Project Adrift, a multimedia art work based on space junk. In the future, these spacecraft may be the targets of orbital debris clean-up. We do have to get rid of some of this stuff before Earth orbit becomes too dangerous. But heritage values should be considered in any proposal to actively remove space junk. The location of these spacecraft in orbit is part of their cultural significance, and many are low collision risks. How do we make sure that significant cultural heritage in orbit isn’t lost, without exacerbating the debris problem? Methods used on Earth include heritage listing, cultural heritage management plans, and mitigation strategies. These can also be applied in space – but some adaptations are necessary. Numerous space places on Earth – like rocket launch sites and satellite tracking antenna – have been heritage listed under national or state heritage legislation. 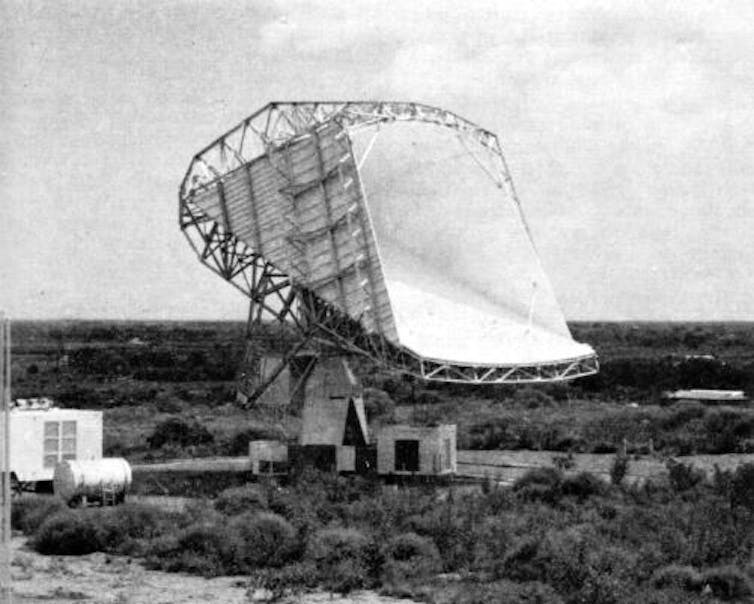 The Casshorn antenna is part of the heritage-listed OTC Earth Station at Carnarvon, Western Australia. However, nations can’t place their orbital heritage on a national heritage register, even though they legally own it. The Outer Space Treaty (OTS) states that space is the “province of all mankind” [sic]. Applying heritage legislation could be interpreted as extending a national jurisdiction into space, and thus making a territorial claim in contravention of this principle. The UNESCO World Heritage List can’t be used to safeguard orbital heritage either, even for spacecraft which have “outstanding universal value”. The World Heritage Convention does not cover “moveable” objects like our high-speed space junk. And despite its name, the World Heritage List is dependent on nations nominating properties: it is rooted in the nation-state. The answer may be to turn to Non-Governmental Organisations (NGOs) or other international organisations, which can’t assert national interests in space. The Inter-Agency Space Debris Co-ordination Committee, with 13 member space agencies from across the world, could play a lead role in managing research and processes. But why not adapt an existing list? While not providing legal protection, these lists do lend “moral weight”. For example, the American Institute of Aeronautics and Astronautics maintains a Historic Aerospace Sites list, which includes Tranquility Base on the Moon. The United Nations Office of Outer Space Affairs has a register of all objects launched into space, the European Space Agency keeps the DISCOS database of space debris, and the International Council on Monuments and Sites could provide expert heritage advice. We could also do it in reverse. A number of satellites consistently appear on hit-lists for urgent removal. Among them are Midori-2, Metop-A, Metop-B, COBE and the number one risk, Envisat. 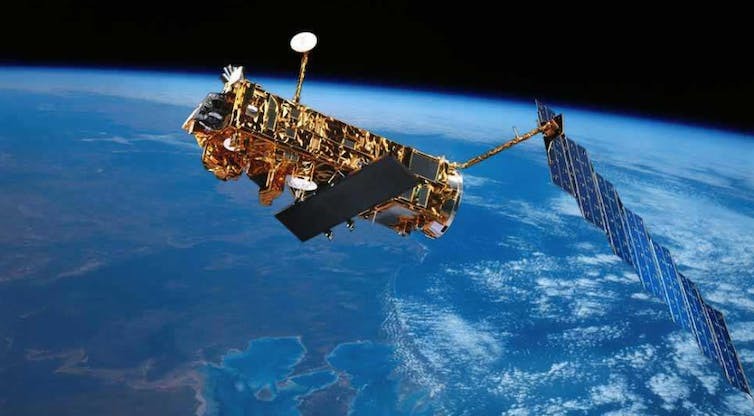 Launched in 2002 for Earth observation, Envisat is one the largest spacecraft in orbit. Contact was lost in 2012, but it is likely to remain in orbit for another 150 years. Some predict that collisions with Envisat could generate enough debris to trigger the self-sustaining cascade of collisions dubbed the Kessler Syndrome. For Envisat, cultural significance is never going to outweigh the risks. A Cultural Heritage Management Plan for the satellite would start with a significance assessment. Ideally, the satellite would be fully recorded before its de-orbit, so that this documentation could be used for further research. However, this is not feasible at present. Instead, we could propose an offset. The idea is that a loss in one area is “offset” by preserving or investing in an area of equivalent environmental or heritage value. A heritage offset may involve an effort to gather and curate associated documentation on Earth; to collect oral histories about the satellite; and to locate components, models, prototypes, or fragments which survive re-entry. This ensures that maximum information about Envisat remains for those studying 21st century human activities in orbit. Heritage isn’t an optional extra in space. It helps preserve the cultural diversity of humankind, as recommended in the 1977 UNESCO Declaration on the Responsibilities of Present Generations towards Future Generations. Recognising the orbital heritage of countries or groups usually marginalised in space exploration fosters an inclusive approach to space. Heritage allows us to explore relevant principles for international agreements on mitigating orbital debris, which are progressing far too slowly given the urgency of the problem. But most importantly, protecting culturally significant spacecraft enables people on Earth to feel connected to space as the common heritage of humanity. This article is based on a paper presented at the 68th International Astronautical Congress taking place this week in Adelaide, South Australia.